Girls 14U Legacy strikes Gold in 15U! In their third tournament playing up in 15U this season, Legacy played in the 15U McGregor Cup, Trillium F division, in Peterborough on February 8th/14. Legacy was hot all day, sweeping through every match in 2 sets – vs. Peterborough Thunder Storm (25-5, 25-22), STVC Nemesis (25-21, 25-14), Durham Attack White (25-14, 25-11), and Evolution (25-13, 25-18), taking them to the Gold medal match vs. Peterborough Thunder Extreme, who couldn’t stop Legacy’s momentum. 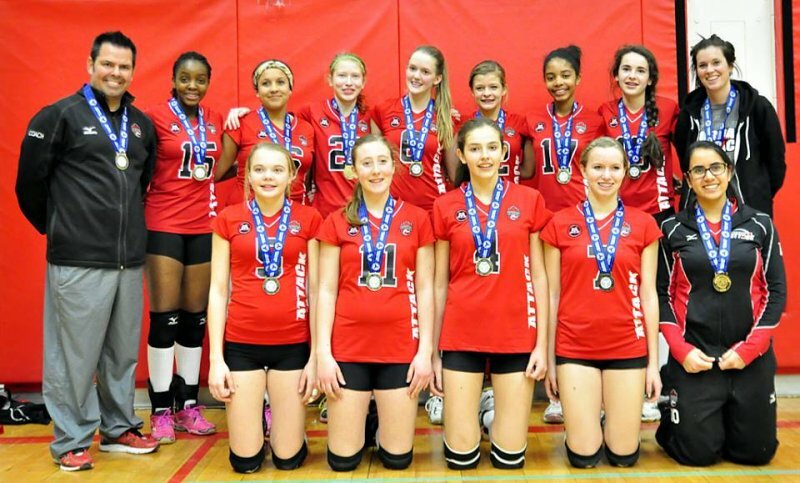 With great serving from more and more players, great blocks and attacks, Legacy earned their first 15U Gold Medal – and the second Gold medal of the season! A day to be proud of, and a great boost of confidence as they head to the U.S. next week! Heat tested their mettle in the Championship East division of the Bugarski Cup in Richmond Hill.